Warren’s childhood seemed happy enough. He lived on a large estate, and he sought adventure. Much like Hank, Warren drove his parents nuts with dangerous stunts. He was a fearless boy, climbing in trees, on roofs, and wherever else he could. Heights never bothered him. 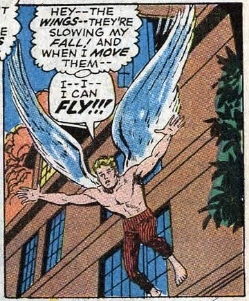 He also didn’t have wings, so he had no reason to feel like an outcast. These were happy times. His situation changed once he hit puberty. Like so many mutants, his powers began to manifest as he grew. In school he excelled at sports, and yet he faced ridicule for looking different. Already kids were noticing that his shoulder blades were mutating. Warren began to worry when he found a feather in his bed, unsure of where it came from. Soon there was no denying what was happening to him. He was growing wings! Horrified, Warren hid them from his school, thankful that they were small. 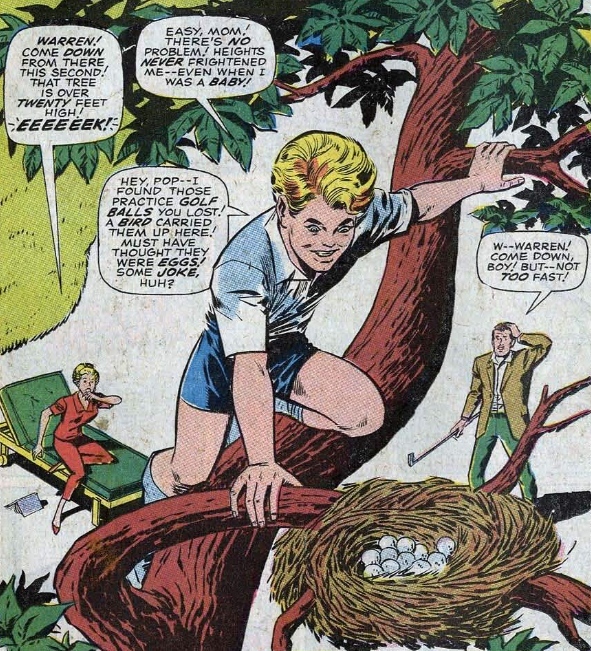 Just looking at this panel it’s clear why teenagers found it easy to relate with him. Who hasn’t looked into the mirror at that age and been horrified with how their body was changing? This is a rite of passage for teens, it’s just most of us don’t grow wings. Still, I can imagine that same panel happening where Warren is horrified of a pimple or his physique. Marvel is tapping into the basic fears that all teenagers face. But before long they would grow to full wingspan, and Warren would spiral into a depression. How could anyone ever accept him? Surely he would be lonely and miserable his entire life. Who would want a relationship with some kind of freakish bird man? It is only when his dormitory catches fire that he attempts flight for the first time. Luckily, he doesn’t kill himself. Warren does way better than Banshee did in X-Men: First Class. He flies over to the drama department and grabs an angel disguise. His hope is that he can save his peers without being recognized. It works, and all the authorities know is that bunch of kids claim to have been saved by an angel. Praise the lord. Fast forward to a bit later in life, and Warren has put his talents to good use. 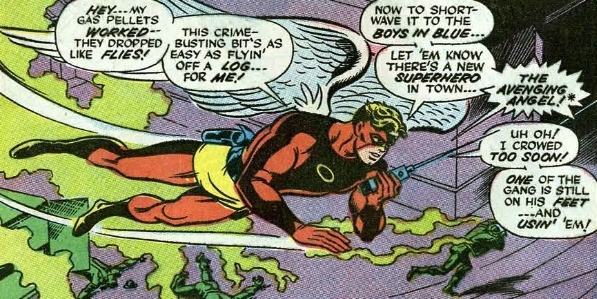 He’s decided to start fighting crime, calling himself the Avenging Angel. He even built himself a gas pellet gun and a snazzy outfit. It’s not his best, but it’s a hell of a lot better than what he’s been wearing with the X-Men recently, that outfit with the suspenders. He gasses the crooks and leaves them for the police. He also leaves a phosphorescent emblem behind, his calling card. It’s a glowing halo, signifying that the Avenging Angel has done his duty. This whole scene reminds me of Golden Age Batman. 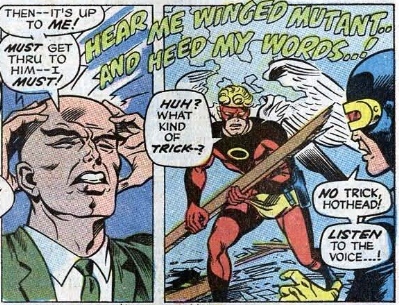 Meanwhile, the X-Men have located Angel with the use of their special super computer Cerebro… I mean the television. They watch him on television, just how they find all their mutants. 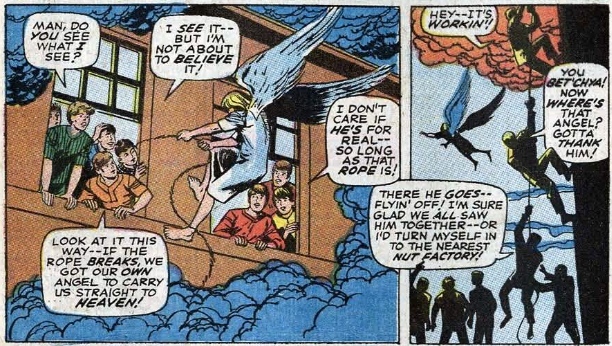 However, the Professor does find him with Cerebro also, solidifying their theory that this winged man is actually a mutant. So it was good for something. Now it’s off to catch a bird. 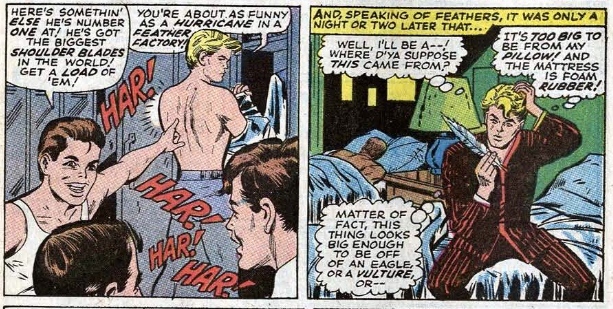 Scott and Bobby simply wait for Warren at his apartment, after tracking his movements with Cerebro I’m sure. They ask him to join their team. Of course a big fight breaks out, with Warren saying he’s such a loner and blah blah blah. We’re heard it all before. Bobby must now be realizing how dumb he sounded. The Professor has to intervene, calming Warren down with telepathic messages. Warren listens, and understand that they are all in grave danger. Warren has an item that some thugs were trying to steal, something that he means to return to its rightful owner. And big surprise, that thing is a power device and it’s now about to explode with the power of a nuclear bomb. The only thing that will disarm it is a drastic drop in temperature, which if you ask me is a strange way to stop a nuclear bomb. Unfortunately, Bobby has been knocked out in the fight, so Warren has to save the day. 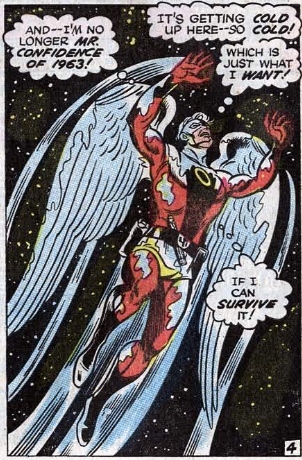 He flies straight up, high into the outer reaches of our atmosphere. He disarms the bomb, but not before freezing himself. Unable to flap his wings, he drops to Earth. At the last moment he regains movement and is able to save himself. The whole scene is a lot like what we would later see in Iron Man, when Tony first tests the limits of his suit. 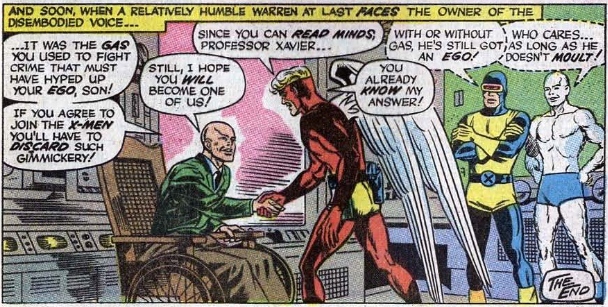 And when it’s all over the Professor invites Warren to join the X-Men. Warren accepts, but Scott doesn’t look too thrilled. He already feels threatened by Warren’s mask of confidence and bravado. This is also the last we’ll see of that costume. 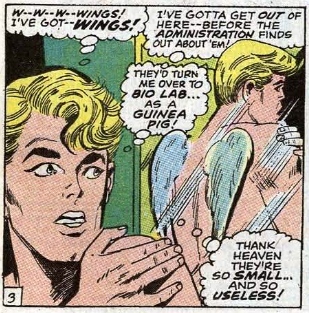 Warren Worthington is, as I said, a tortured soul. He was born with everything a person could ever want. His family is extremely wealthy, and he has access to all the finest things in life. His wealth, charm, education, good looks, and demographics place him at a significant advantage in our modern world. And yet happiness eludes him. He is forced to carry this heavy burden, a mutation, a deformity, a pair of feathered wings. It destroys his self image, creating anxiety and depression. He can never be happy. He grew up in the lap of luxury, but can never relax. He has been given every opportunity, but belongs nowhere. Society tells him that he has everything he needs to be happy, but the problem is within himself. Warren masks this with an outward display of ego and cockiness, causing many around him to think he is stuck up. Later in life his hatred of his body will cause him to lose everything, a tragedy that I can’t wait to read. His story has always resonated with me. 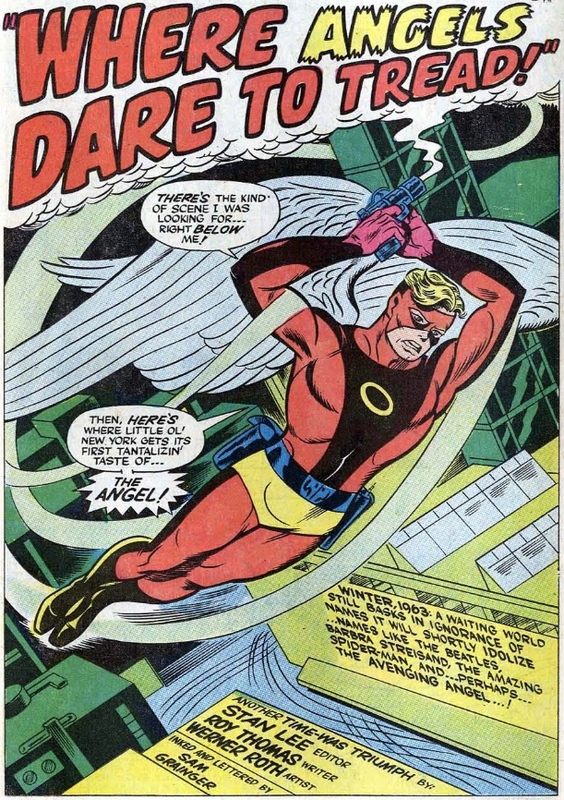 Posted on September 4, 2014, in Angel, Ed Posts and tagged Angel, Avenging Angel, cerebro, comic books, comics, marvel, mutant, origin, professor x, Warren Worthington, Warren Worthington III, x-men. Bookmark the permalink. Leave a comment.